Rivalry game fits into the Utes’ attractive home schedule. (Trent Nelson | The Salt Lake Tribune) Utah Utes linebacker Cody Barton (30) sacks Brigham Young Cougars quarterback Tanner Mangum (12) as BYU hosts Utah, NCAA football in Provo, Saturday September 9, 2017. The eight-month wait for college football season makes every game grow in importance, yet some of them are more meaningful than others. The Golden Eagles are the state’s most randomly selected opponent since Savannah State visited BYU in 2014. The Aggies crushed San Jose State 61-10 last year, when the Spartans were outscored 156-46 by three Utah schools. This is good scheduling, with a decent FCS opponent coming in between BYU’s games vs. Wisconsin and Washington. Arizona plays three Utah schools in the first seven weeks of the Kevin Sumlin era. There’s always some mystery about playing in the islands, but the Aggies dominated Hawaii in a 38-0 win last season. This would have been a better matchup last November, when the Aggies were making program history. Some projections says the Cougars’ critical sixth win could come on Senior Day. The best game in the state on this day is Weber State vs. Eastern Washington in Ogden, a meeting of potential top 10 teams in the FCS. The Lobos stole a win in Logan two years ago, but they went 1-7 in the Mountain West last season. The Beavers have been vulnerable against Big Sky schools in recent years. Could this be the breakthrough for SUU? This is a case of unlucky timing for the Aggies. MSU is very good again. BYU’s secondary made Badgers quarterback Alex Hornibrook appear unworldly, as he completed 18 of 19 passes for 256 yards and four touchdowns in a 40-6 rout last September. How much will change in one year? (Chris Detrick | The Salt Lake Tribune) Wisconsin Badgers running back Garrett Groshek (37) leaps over Brigham Young Cougars defensive lineman Trajan Pili (52) during the game at LaVell Edwards Stadium Saturday Saturday, September 16, 2017. 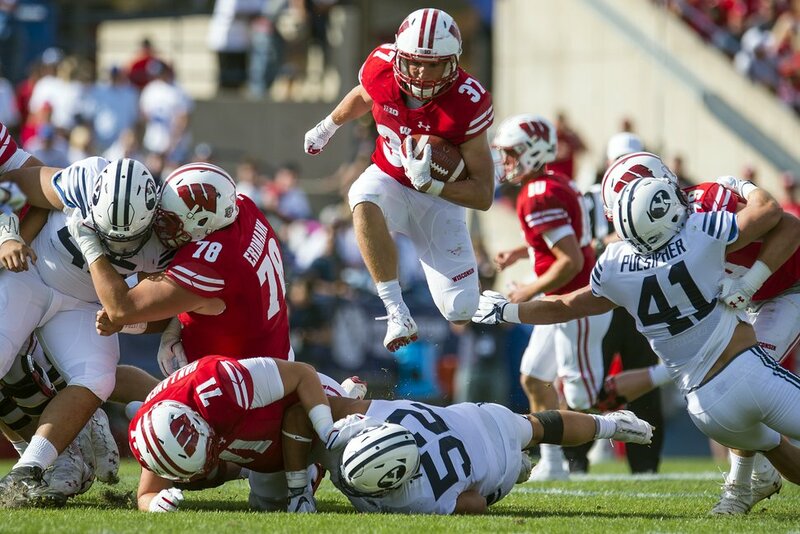 Wisconsin Badgers defeated Brigham Young Cougars 40-6. This game would have been more appealing last season, when the Wildcats were capable of beating a Pac-12 team as they showed by leading California in the fourth quarter. Even so, WSU coach Jay Hill’s return to Rice-Eccles Stadium will be fun. This is the 10-year anniversary of BYU’s memorable 28-27 win in Seattle. That was one of the Cougars’ best teams in recent history; the Huskies finished 0-12. The Rams supposedly will drop off this season, but they looked like one of the best opponents on USU’s 2017 schedule. Dylan Collie’s name will be prominent in advance of this game. He caught six passes for 103 yards against BYU in his last game for Hawaii, before rejoining the Cougars as a graduate transfer. This matchup potentially will decide a division title in the Mountain West. The Aggies hope so, anyway. They also would like to perform better than the last time they had that opportunity, losing 50-19 at Boise State in 2014. Last December’s Arizona Bowl produced one of the best atmospheres and most competitive games of the 2017 postseason. NMSU’s overtime victory, partly resulting from USU kicker Dominik Eberle’s rough day, will motivate the home team. The Huskies have a strong Group of Five program, and four games with BYU and Utah over three seasons will make them recognizable around here. This matchup would be easy to dismiss, except the Minutemen’s victory in Provo last November makes BYU’s visit meaningful. And at that stage, the Cougars hope to be clinching bowl eligibility. 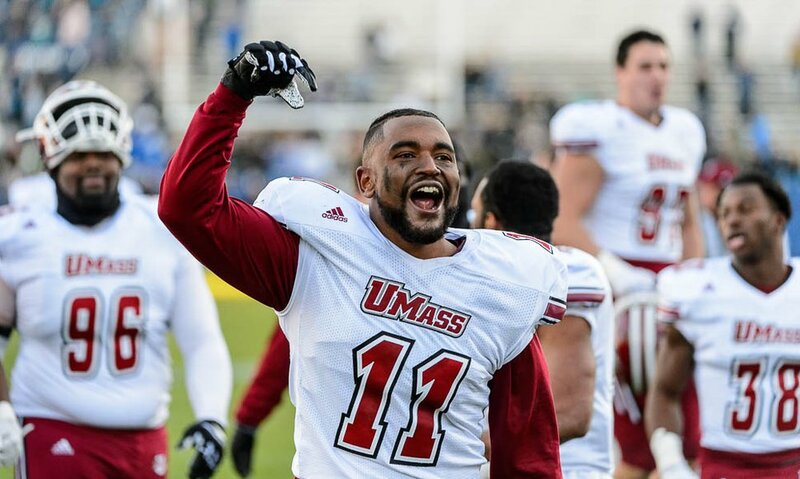 (Trent Nelson | The Salt Lake Tribune) Massachusetts Minutemen defensive lineman Roderick Jones Jr. (11) celebrates the win as BYU hosts the University of Massachusetts, NCAA football in Provo, Saturday November 18, 2017. The Aggies fumbled away their chance to beat Wyoming in Logan last October. This is another game that will determine whether USU can stay in the division race. USU’s season theme continues, with another opponent that the Aggies should have beaten in 2017. The Aggies’ MW opener will be telling. All nine of Utah’s conference games have intrigue, although one of them has to rank last on the list. The value of the trip to Pullman involves how the Utes need to beat somebody from the Pac-12 North, and this may be their best chance. This game will rise in importance if a victory in Boulder would complete the Utes’ first Pac-12 South title-winning season. Remember this name: Sutton Smith. Pro Football Focus graded him as the top returning edge defender in college football. This game will be tucked away in a tiny stadium and televised by ESPNews, but NIU is much better than the likes of Fresno State and San Jose State, Ute opponents of the past four Septembers. The Cougars and Broncos have developed a decent rivalry in this decade, with the series moving into November for the first time. Will this be a hometown appearance for BYU’s Tanner Mangum as a starting quarterback? Much more will be known about Herm Edwards as the Sun Devils’ coach by this point of the season. And the Utes will be in the middle of eight straight Pac-12 games, following their bye. Nobody’s sure how much time UCLA coach Chip Kelly needs to get the Bruins’ offense humming. The Utes hope it takes him longer than two months. The impact of this game involves two factors: BYU’s bowl-eligibility math and the rest of the September schedule. Cal represents the the Cougars’ best hope for an FBS victory in the opening month. These programs are a lot alike, explaining why they’ve staged close games in all three meetings of the Pac-12 era. The Utes did a good job of containing Stanford’s Bryce Love last October, except for one 68-yard touchdown run. (Rick Egan | The Salt Lake Tribune) Stanford Cardinal running back Bryce Love (20) runs for the winning touchdown, in PAC-12 football action, at Rice-Eccles Stadium, Saturday, October 7, 2017. There’s even more curiosity now about the direction of BYU’s program than in 2016, when Kalani Sitake made his coaching debut with a win over Arizona. The unknowns about Sumlin’s effect on the Wildcats make this opener even more interesting. What other surprises could this series produce? In the past three meetings, the Utes have scored 62 points, allowed a touchdown pass in the last two seconds and surrendered 347 rushing yards in another defeat. The value to each team increases the rivalry game’s importance. Last season’s win ultimately made USU bowl-eligible and accelerated BYU’s slide. This year’s game could determine whether the Cougars make a bowl game or the Aggies have a great season. The Utes and Wildcats are being given basically the same odds of winning the Pac-12 title, and this Friday night game will help decide which team becomes USC’s biggest challenger in the South. Utah didn’t face Arizona QB Khalil Tate last season. 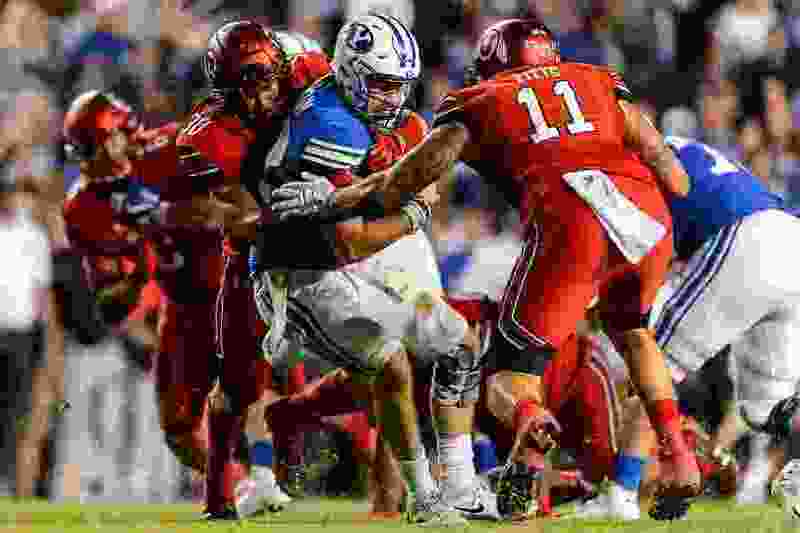 Until the Utes win a record 10th straight game in the series and produce more than one rout in this decade, the rivalry will have relevance, even beyond its historic meaning in this state. The streak stands at seven games. And if the Utes have won the Pac-12 South title, they’ll need a good showing for the sake of New Year’s Six possibilities. The rivalry will move to season-opening dates in 2019 and ‘20. The Huskies probably won’t be the highest-ranked team ever to visit Rice-Eccles Stadium, but they might be the best. They’re loaded with talent as the Pac-12′s strong favorites, although the Utes could or should have beaten them each of the past two years. The late-night kickoff on ESPN will produce a frenzied atmosphere. Utah could beat the Trojans and still not win the South championship. But there’s practically no chance for the Utes to win the title without knocking off USC, as they’ve done the last two times the Trojans came to town.